Over seven years ago, I wrote about my love for the State of the Union Address. I made it clear that while I don’t necessarily watch it for the policy, I do tune in for the tradition, formality, and importance of the speech. I think it is a crucial and distinguishing component of the American democratic system. As you can imagine, I watched last night’s State of the Union in its entirety. Considering who gave the speech, it was anything but conventional. From a non-partisan viewpoint, I wanted to give a few thoughts on Tuesday evening’s address in the Capitol. President Trump delivered te 2019 State of the Union Address. 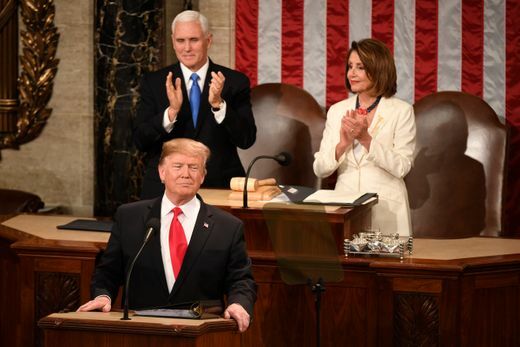 Perhaps the first surprising aspect of the 2019 SOTU was that Donald Trump was delivering it. Over two years after his inauguration, he is still the President of the United States. After he won the election, I listened as countless people predicted he would have resigned or been removed from office by now. Well, President Trump still lives at 1600 Pennsylvania Ave. I don’t think Donald Trump will ever resign the Presidency simply because he likes the State of the Union too much. Two years ago, during his State of the Union-ish “Joint Address to Congress,” I tweeted about how he genuinely seemed to be enjoying the moment. It was the exact same case last night. President Trump feeds off the pageantry of the SOTU and I think this gleefulness allows him to perform considerably well. I noticed it two years ago and it was even more evident last night — President Trump loves the State of the Union. Last evening was no exception. By all counts, President Trump brought his “A” game. I think the first key to his big night was his guest list. He brought in numerous special Americans who he recognized throughout his speech. He celebrated their accomplishments while weaving in his agenda. With individuals such as WWII veterans, a decorated astronaut, a Holocaust survivor, and a hero who ended a mass shooting all in attendance, the entire chamber–Republicans and Democrats alike–was constantly erupting in applause. I believe President Trump’s tone was key to his success as well. Throughout the 82 minute address, he mostly spoke in a respectful, calm manner, something you don’t always see out of him. However, he changed his tune when he needed to. When addressing comments made by the Governor of Virginia and when stressing the importance of respecting life, he became serious and firm. It was powerful. The President also won over the Democrats (for a second at least). He recognized the many women who won seats in Congress, noting that progress is being made. Spontaneously, the Democrat half of the chamber popped up and started celebrating. Not missing a beat, President Trump smiled and said “You weren’t supposed to do that.” Trump successfully created a special moment of bipartisanship celebration and unity, something no one expected to see. At that point, the 2019 State of the Union was officially a success for #45. It wouldn’t be a President Trump speech if he didn’t go off script. Several times last night, including the moment I just recapped, Trump ditched the teleprompter to add some short commentary between sentences. This always humanizes him, sometimes for the better and sometimes for the worse, but last night it worked. Don’t think I am giving President Trump a complete pass. Some of his transitions from one topic to the next were bad. Not enough practice? I don’t know, but at times it was awkward. He also lacked energy at certain points during the address. I have noticed this in some of his other speeches as well. I guess it can happen when you are speaking for almost 90 minutes, but giving the most important speech of the year is never a time to show fatigue. However, from an unbiased/independent standpoint, last night appeared to be a victory for President Trump. That is just my opinion. But my conclusion is also backed up by the American people. After the 2016 election, I stopped trusting polls, but I have seen that most networks released polling results giving the President a 76% approval rating. A number that high, regardless of the margin of error, indicates that the Commander-In-Chief had a good night. I will look forward to the 2020 State of the Union Address. Let’s hope good things continue to happen for this country and that next year’s speech is one that all Americans can celebrate. Don’t Blink.